The Integ design philosophy is based around simplicity and modularity. Simplicity translates into reliability of the product. Once set up, the product will maintain its position until it is moved. Modularity refers to the 'building-blocks' style that allows many configurations using a standard set of components. This also allows future upgrades to be added on, for just the cost of the additional parts. Floor Mount - free standing or floor to ceiling post. All Apollo posts share the proprietary slot, from single-slot through to 6-slot configurations. This commonality allows the same connector to fit any Apollo post. Multiple slots allow multiple attachments to slide past each other, or be fixed at the same height, on the post. 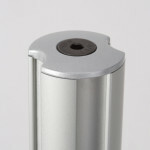 The Post can be any length to suit your requirement. The Post can include sockets for power/usb/phone/internet. An Arm is connected to the slot in the post to give range of horizontal positioning. An Arm can be made of a number of sections, or 'limbs', from zero to usually 2 or 3. The Knuckle attaches to the last limb on the arm, giving tilt, turn, and rotate potential at the end of the arm. Tilt the screen to relieve glare. Turn the screen to face you or to share with your audience. Rotate the screen from landscape to portrait to view tall documents or websites, for less scrolling.